I believe that Beaujolais is capable of being one of the great wines of France. 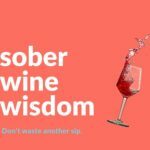 There is a lot of average commercial wine that is often a wine lovers first experience. And a lot of people don’t get over that initial taste of cordial labelled as wine. However, I am here to say it is time to jump in and try it. With new eyes if you’ve been burnt. Almost always red wines that are aromatic, light of body, high in acid and made from the Gamay variety. There is a Burgundian sensibility on Rhone soil types which makes for an interesting style. The quality wines are refreshingly tart with aromatic complexity and enough fruit weight to balance out the tartness. Due to their light weight Beaujolais is under estimated for their ability to age at all, the great Beaujolais can improve over the mid to long term. Although the best wines are often found in 10 Crus of the region, some of the lesser appellations can impress. Whites from Chardonnay are available but hard to find. Grown in the French regions of Beaujolais and Loire Valley. It is early budding, high cropping, aromatic and high acid. It was outlawed from Burgundy by Duke Philippe the Bold for being disloyal but has no doubt made up for that with honourable service. The best wines from Gamay can be Burgundian in flavour and well worth seeking out. Often they are exceptionally good value too. 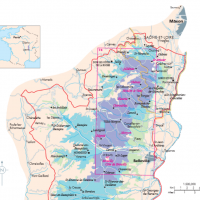 There are ten Crus or specific sub regions of Beaujolais. Each one has a typical flavour profile and texture. Having lined up most of them for a dinner I can attest to this. Below is a brief explanation of what to expect from each. This is considered the sturdiest, most tannic, longest-lived of the Crus Beaujolais. When you hear about folks opening up delicious bottles of 50-year old Beaujolais, it’s usually Moulin-a-Vent. But remember, we are still talking about Gamay. The wine is never that tannic, and most examples are still very approachable when they’re young, unless the vintage is a particularly structured one. This is the closest to Moulin-a-Vent in terms of weight and structure, and it can age nearly as well. It has a firm minerality, thanks chiefly to its granitic soils, and a fruit profile that shades towards orange. Outside of Morgon, Fleurie appears to have the greatest concentration of good producers. And with particularly fine terroir, Fleurie is another great source of Cru Beaujolais. “Fleur,” of course, means “flower” in French, and indeed the wines of Fleurie are characterized by a distinct floral note – think violets. Juliénas is another Cru known to be a little sturdier than the others and so can be aged. The wine’s signature profile is deep red cherries, which transform with a few years of bottle age into nuanced flavors that veer towards cassis. As the word “Côte” implies, the Côte de Brouilly lies on the side of a hill. Its neighbor, Brouilly (without the “Côte”), is at the bottom. Predictably, Côte de Brouilly tends to ripen better, and it produces a more structured, elegant wine. Brouilly produces a lighter style Beaujolais for early drinking; it makes frequent appearances in the simpler bistros that dot Paris. 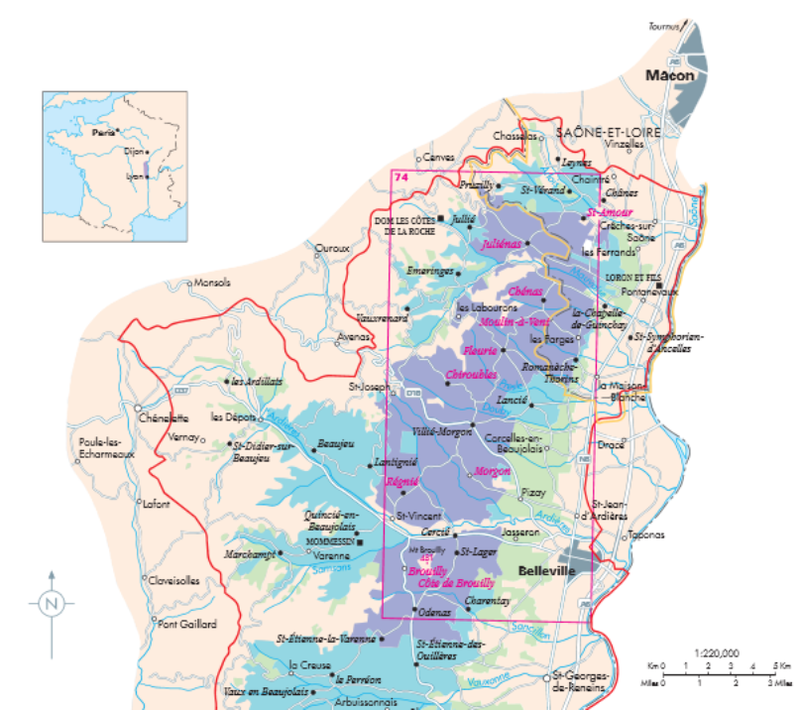 St. Amour is the most northerly Cru, bordering the Mâcon region of Burgundy. At its best, St. Amour is an intensely red-fruited wine, bearing a bit of a resemblance to its much more expensive cousin to the north, Les Amoureuses. The position of Chiroubles’ within the Crus is unique, as it is at the very highest altitudes of Beaujolais and the grapes take about a week longer to ripen than elsewhere. Chiroubles tend to have quite a bit of complexity, even as young wines, which makes the appellation a great source for Cru Beaujolais to drink young. To me, this complexity derives from a lovely velvetiness that is absent in the other Crus, as well as a floral note that is reminiscent of Fleurie. In the vineyard, Régnié is distinguished by its pink granite soils. In the mouth, it seems to have a slightly spicier profile than the other Crus. It’s a lovely wine in the right hands. Chénas produces a tender wine that can age surprisingly well. As the name suggests, the wine comes from distinct, quartzite soils. But even young the wine has an mineral intensity (which, with age, becomes somewhat iodiny) which gives it a fine complexity.